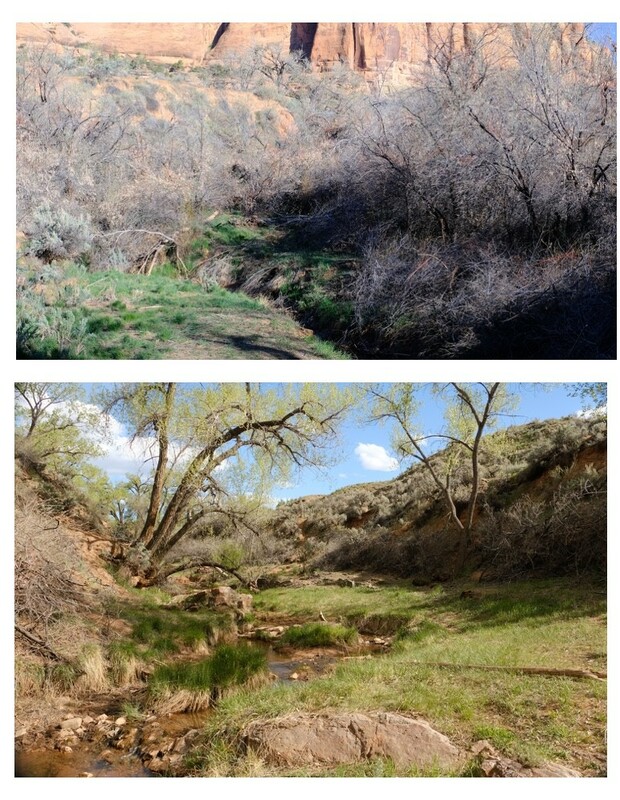 The Little Dolores River runs approximately 20 miles through Mountain Island Ranch, in western Colorado and eastern Utah south of the Colorado River, and is comprised of an impressive gallery of native cottonwood trees and associated willow and other riparian vegetation, heavily used by wildlife. 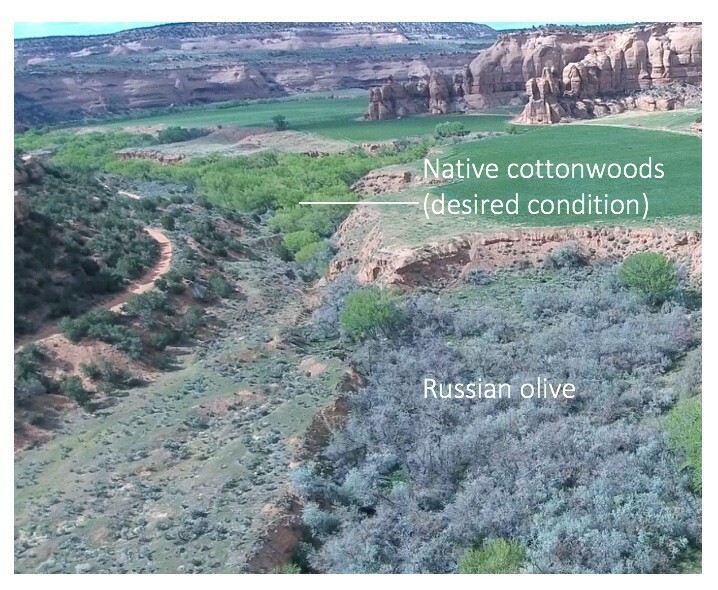 However, as in much of the Intermountain West, non-native Russian olive (RO) and tamarisk (TAM) trees have completely taken over some sections of the riparian, and elsewhere appear in scattered lesser amounts. 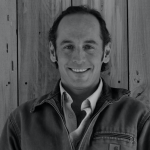 Without action, over time it is likely that RO and TAM would complete their takeover of the riparian area. In addition to their noted water consumption, these species grow so dense as to inhibit wildlife movement through their stands; and little light reaches the ground, thus prohibiting growth of forage and general plant diversity. Much TAM has been killed by the tamarisk beetle (which was recently introduced to control tamarisk, which lacked native predators in North America), but dead TAM remains in place for many years, and once dead has little value to birds or other wildlife and should be removed. 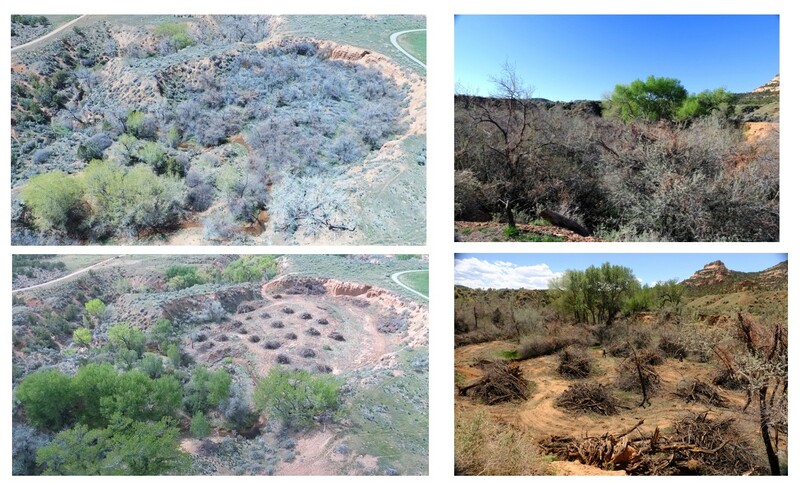 Our goal on our organic cattle ranch is to completely eradicate tamarisk and to manage Russian olive to an acceptable minimal level that recognizes the food value RO seeds provide wildlife, but prevents it from overtaking native vegetation. Russian olive re-sprouts vigorously from cut stumps, and thus containing it requires application of herbicide or complete removal by pulling the root ball. Being an organic ranch, herbicide use here requires fencing cattle out of treated areas for 3 years, making restoration logistics challenging. To study the logistics, costs, rebound of native vegetation, and efficacy of various methods of removing RO and TAM prior to planning a watershed-wide, multi-year restoration project, we chose one of the worst sections of RO and TAM takeover to do a pilot removal project. RiversEdge West generously provided direction and funding for one week of a mechanical crew and an 18-member chainsaw/hand crew to treat a 10-acre project area. Where machine access was possible, an excavator yanked entire RO trees from the ground, roots and all, to be piled by a skid-steer for later burning or simply left for wildlife denning sites. Where terrain was too steep for machines, hand crews felled trees and sprayed the stumps’ cambium rings with herbicide. We left some trees standing along the riparian to provide shade until native cottonwoods and other vegetation rebounds. This fall we will plant several hundred native shrubs in the worst sections where nothing but RO and TAM grew, and we will likely need to retreat some cut stumps with herbicide. The project area represented the worst of the worst; and having now observed the treatment options and logistics, we know that further downstream there are areas where we will be able to clear several miles of invasives in a week. 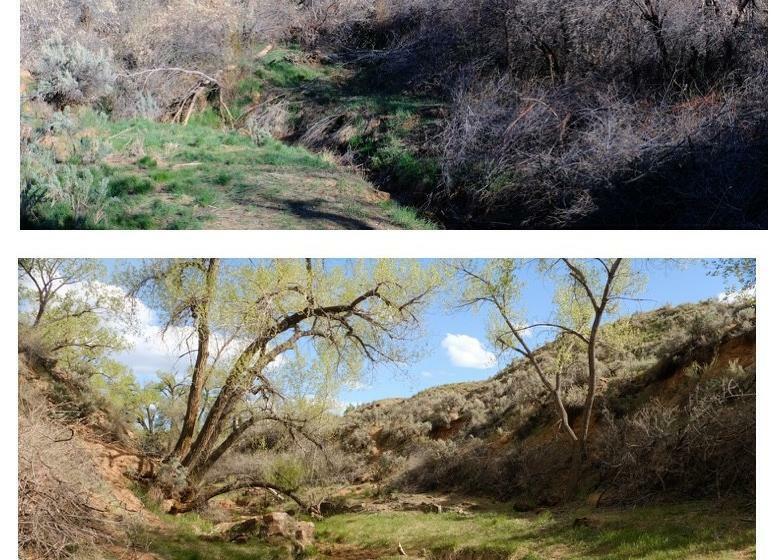 Given that we control the entire lower half of the Little Dolores River (which drains directly into the Colorado River, upstream of the Dolores River), and that fewer than 20 owners control the upper watershed, it’s possible that in time we will succeed in restoring our portion and inspire the neighbors to follow suit, resulting in an entire watershed brought back to a healthy, native-vegetation dominated system.